Experience a one of a kind monster truck tour with this 2-hour joyride. This small-group tour is led by a local guide as they take you for a ride down Nashville's famous Broadway in the back of the 'Music City Monster' in true southern fashion. When you tour in this beast you will turn more heads than you can count as you see Nashville’s downtown district from a higher level! Meet at the Joyride headquarters in central Nashville at your chosen departure time in the morning, afternoon, or evening. 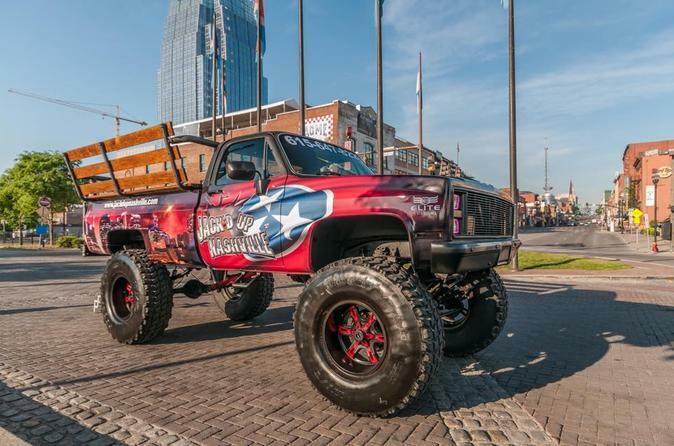 Once everyone arrives, stock the included coolers with your beverages of choice and climb aboard the "Music City Monster" truck to ride through the streets of downtown Nashville for an experience unlike any other. Turn heads and make everyone look up at you as you cruise the streets with a very unique perspective. High above everyone else, you will make spectators jealous that they didn't come along for the ride. Everyone will see and hear you coming from down the street. This experience is tailored to the group. It can be a full sightseeing tour throughout Nashville, so you may experience the incredible city and see all it has to offer, or it can be a basic cruise along the streets. Come get Jack'd Up!